We are all familiar with the fact that a candidates’ confidentiality is at the heart of any Executive Search or hiring process. However, the most sensitive of Searches are when a position itself, that is being recruited for, must be kept a secret. Benjamin Franklin was very wise with his famous quote from Poor Richard’s Almanack, and, whilst not necessarily practical in this situation, it should be kept forefront of our minds when approaching a Confidential Search. 2 – Where there are wider implications for the organisation of an Executive moving on. Keeping the details out of the market and general circulation both internally and externally until the last minute is especially challenging, but completely necessary in both cases. The primary responsibility for delivering a truly Confidential Search sits with the company itself. From our experience, you might be surprised to hear that, on the odd occasion where word gets out, this has not been as a result of the Search Process or any information that has been disclosed by a potential Candidate. When you think about it, this is not really that surprising – candidates are just as worried about the confidentiality of their own job search and take confidentiality seriously, approaching the whole process with extreme caution. Having a Search Firm involved is critical to them since direct liaison with the Client is high risk. From the Search Firm’s point of view, its own reputation is at risk and it will do everything in its power not to jeopardise this. It will ensure the process is as tight as it needs to be, bringing previous experience of running Confidential Searches to bear on the situation. If a company tries to run a Confidential Search directly rather than use an external Search Firm, at a minimum, it would need to involve a couple of members of the HR Team in addition to key Executives or Board Members who are aware of the role. Already the secret is held by at least 4 people… and they are living, breathing, and most importantly, talking humans! It is also inevitable, with the administration involved in organising interviews, that it will have to involve PA’s or HR Admin to organise logistics. Can you imagine trying to ask the MD or CEO to organise all the interview arrangements? It is simply not practical, not to mention best use of their time. Adding in each additional person into the loop of secrecy internally, immediately creates risk of the secret getting out. It’s rarely intentional I should add, simply human nature, when people are talking about their day with colleagues or loved ones. I should stress here that the more junior members of an organisation are often not the culprit though. In practice, it is often someone at Board level who ‘lets the cat out of the bag’. The reason behind this is usually driven by their understanding of the importance of replacing the Executive, and the potential impact on the organisation if the right person is not found. They simply want to help, and a discrete conversation here or there within their network surely can’t be a problem? I can think of at least two Confidential Searches where word has got out this way. In practice, it’s a significant consideration, and it should not be assumed that, due to the seniority of the people involved, that there is no need to spell out what is expected of them to maintain confidentiality. For many of the reasons above, it is usually a good idea to engage an external Search Firm. Minimise the number of people who hold the secret and keep it to an absolute minimum, usually, but not always, to include the HR Director. Then you really must stress the importance of allowing the Search Firm to handle the whole Search Process and manage all the approaches. Indeed, a part of the internal process which I would recommend implementing, is to circulate the contact details of the Search Firm who is handling the process with those who are aware of the situation. You must insist that Executives forward the details of any recommendations they may have within their network to be approached by the Search Firm and not directly themselves. When the Search Firm approaches Candidates, the initial approach will never mention the Company Name, sometimes not even the sector or country location if there are key dimensions of the role which would narrow down options and allow the Candidate to guess who the organisation is. The Search Firm will undertake initial screening to establish overall suitability against the key requirements of the role before taking discussions any further, ensuring that as few Candidates as necessary are progressed to the point where the ‘secret’ is shared. Getting Candidates to sign an NDA is an obvious requirement but relying on Candidate professionalism and integrity is equally as important to judge before releasing the Company name, as it is to get a signature on a piece of paper. The whole process is not infallible and relies heavily on everyone involved mitigating the risk of a leak at every stage, critically starting within the Company itself. Whatever the reasons for a Confidential Search, the potential pitfalls are the same. Planning carefully how to manage the process internally as well as working with a trusted and experienced Search Firm externally is a good place to start. Please contact me directly if you are considering how to plan for a Confidential Search in your organisation. 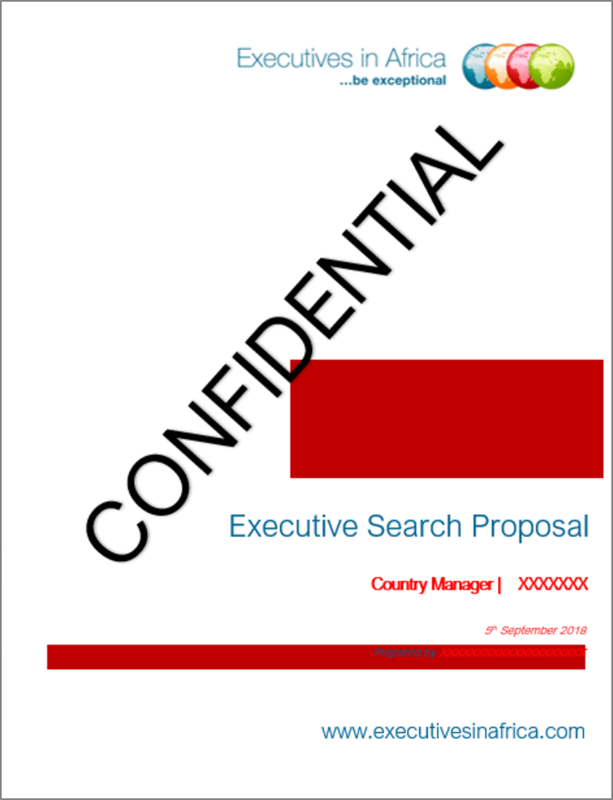 I would be happy to talk through ideas and options as well as how Executives in Africa would support you with the external element of managing and delivering your Confidential Search.